On October 14th, a counseling staff development was hosted at General Ricardo Sanchez Elementary where the counselors selected Mr. Ricardo Garcia-Special Education Resource Teacher-to receive the “Light Keeper” award. This award is given to a teacher that has impacted and lit the way for a child. 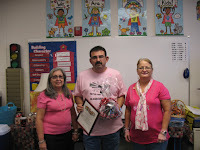 We would like to applaud Mr. Ricardo Garcia’s dedication and commitment to our students and our school.